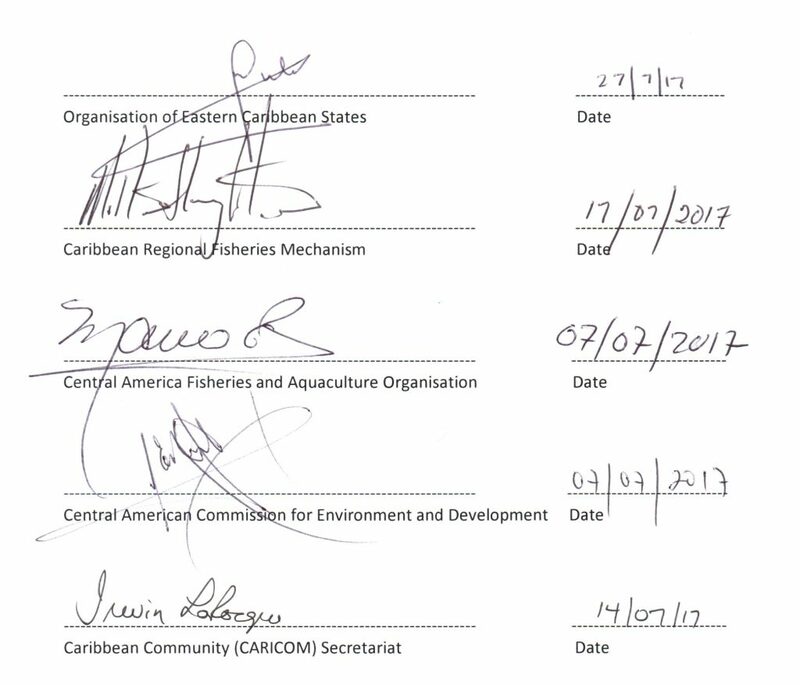 A ugust 8, 2017 – The Interim Coordination Mechanism (ICM) for the “Sustainable Management, Use and Protection of the Caribbean and North Brazil Shelf Large Marine Ecosystems” (the CLME+ region) has been formally established on July 27 through the signature of a Memorandum of Understanding (MoU) by 5 member inter-regional governmental organisations. the Organisation of Eastern Caribbean States (OECS) Commission. In total 8 inter-regional governmental agencies make up the ICM. It is expected that the three remaining organisation will sign the MoU within the next few weeks. They include: the Western Central Atlantic Fisheries Commission of the UN Food and Agriculture Organisation (UN FAO-WECAFC); the Intergovernmental Oceanographic Commission of UNESCO (IOCARIBE of IOC-UNESCO); and UN Environment represented by its Caribbean Regional Coordinating Unit and Secretariat to the Cartagena Convention (UN Environment Programme CAR/RCU). The Coordination Mechanism is expected to enhance regional coordination and collaboration, and support oversight and integration of actions for sustainable fisheries and for the protection and sustainable use of the marine environment. It will further promote the up-scaling of actions by all sectors of society, to achieve the development of sustainable, ocean based economies and the long-term vision of the politically endorsed 10-year CLME+ Strategic Action Programme: “Healthy Marine Ecosystems that Provide Benefits and Livelihoods for the Peoples of the region”. The Coordination Mechanism will be at the heart of a wide-ranging Alliance and Partnership for the sustainable management and use of living marine resources for the CLME+ region (“CLME+ Alliance” and “CLME+ Partnership”) which is expected to be launched in the coming weeks. The activities of the Coordination Mechanism will be supported through the UNDP/GEF “CLME+” Project (2015-2020). For more information on the CLME+ SAP ICM, please visit the following Web Portal: clmeplus.org.